Throughout the seasons the green, gray and colored leaves of living plants form the background and fabric of a garden. The promise of exuberant wildflowers, the golden explosion of flannel bush, and the profusion of true-blue ceanothus—these and other colorful spring blossoms are eagerly anticipated by California botanists and native plant gardeners alike. A bountiful rainy season amply rewards us with this painterly kaleidoscope, which continues—albeit less dramatically—through summer and on into fall and winter. There is a danger, though, in planning a native garden solely for this spring floral pinnacle, since individual plants are rarely in bloom for more than a month or two. What do they look like the other ten or eleven months of the year, and how does this affect the overall garden composition? Gardeners can benefit from a technique used by florists, who add greenery to complement both exotic and pedestrian blossoms. An assortment of bold- to fine-textured greens can turn a ho-hum arrangement into something quite extraordinary. So, too, in our gardens. We can, of course, also incorporate plants that flower at other seasons. In winter, elegant manzanitas (Arctostaphylos) offer up white or pink blossoms, and the silvery, pendant inflorescences of silk tassel (Garrya) can be showstoppers. Goldenrods (Solidago) and California fuchsias (Epilobium, or Zauschneria) hold forth with warm hues during the warm days of summer. The earthy tones of ripening buckwheats (Eriogonum) and ornamental grasses remind us that brown can be a dynamic and alluring color. And a plethora of silver-leaved natives enliven any composition year-round. But back to green. So easily overlooked, this ubiquitous and incredibly variable color plays an invaluable role in the landscape. All gardens, regardless of style, are enhanced by the thoughtful inclusion of plants with attractive green foliage. Think of conifers in gardens back east, the rich green hedges of the British Isles, the expertly clipped parterres of France, the tapestry of greens in Italian gardens, and you quickly see how fundamental this color is in creating good gardens. 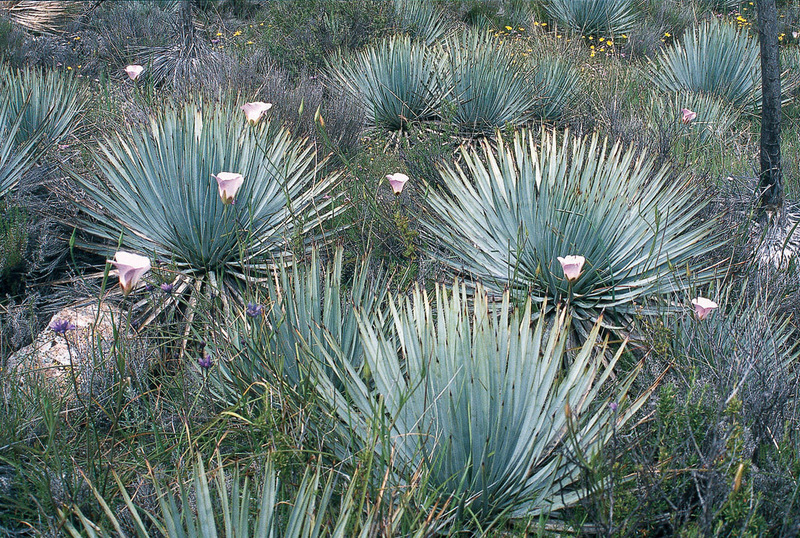 No less so for a garden of California native plants, and, happily, our native flora does not fail us here. Across the spectrum of greens, we have ample choices. 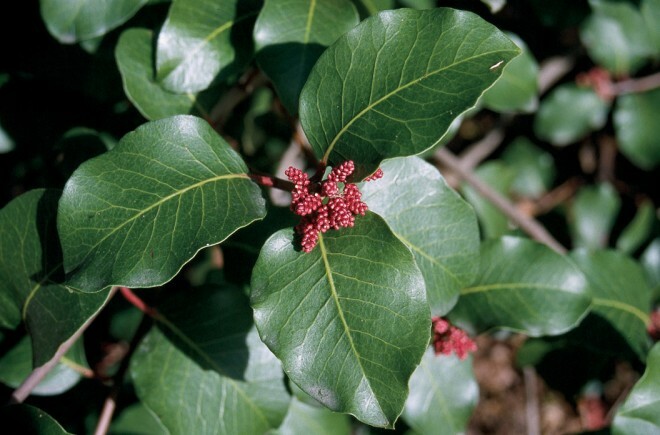 For deep, dark, almost brooding greens, look to coffeeberry (Rhamnus californica), island oak (Quercus tomentella), Monterey cypress (Cupres-sus macrocarpa), or sugar bush (Rhus ovata). In the medium range, consider island snapdragon (Gal-vezia speciosa), any number of sedges (Carex), giant chain fern (Woodwardia fimbriata), or incense cedar (Calocedrus decurrens). 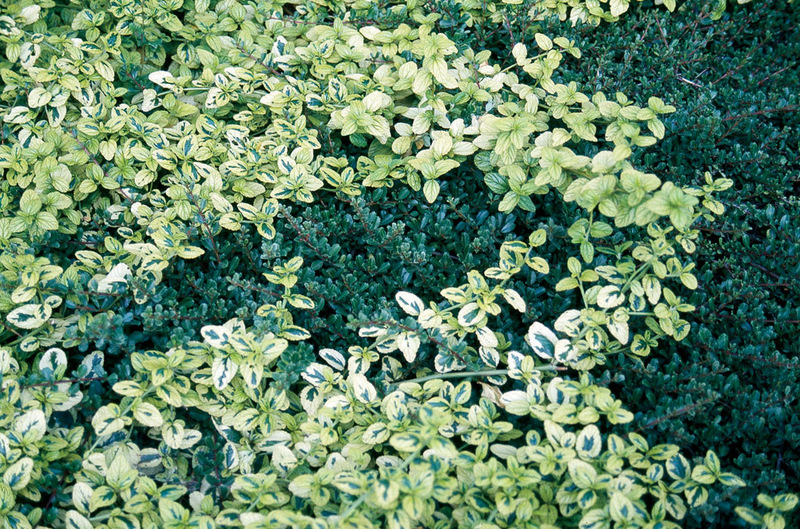 Several native shrubs have glossy leaves that add sparkle to the garden, including Catalina perfume (Ribes viburnifolium), California barberry or Oregon grape (Berberis pinnata and B. aquifolium, respectively), hollyleaf or island cherry (Prunus ilicifolia and P. lyonii, respectively), and Centennial ceanothus (Ceanothus ‘Centennial’). 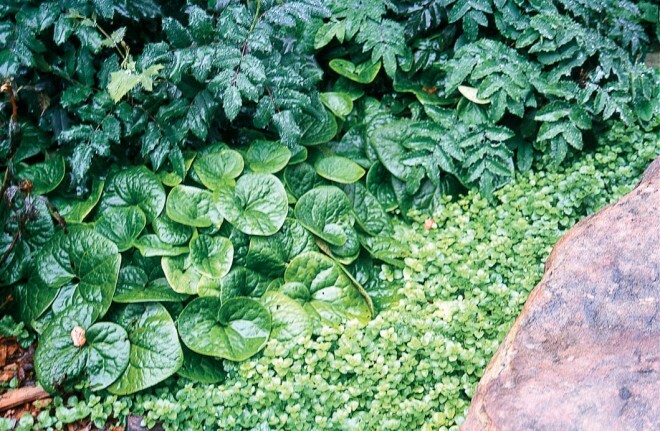 A number of herbaceous perennials, such as beach strawberry (Fragaria chilensis) and western ginger (Asarum caudatum), share this polished leaf surface. If you are partial to softer shades, many species with gray green leaves beckon: purple sage (Salvia leucophylla), St Catherine’s lace (Eriogonum giganteum), Indian mallow (Abutilon palmeri), bladderpod (Isomeris arborea), and California fuchsia (Epilobium canum). All of these might already be on your wish list for their wonderful flowers. Another choice group of natives offer glaucous, blue green foliage. Bigberry manzanita (Arctostaphylos glauca), island bush poppy (Dendromecon harfordii), chalk dudleya (Dudleya pulverulenta or D. brittonii), Our Lord’s candle (Hesperoyucca whipplei), scarlet bugler penstemon (Penstemon centranthifolius), and Canyon Prince ryegrass (Leymus condensatus ‘Canyon Prince’) are just a few options. Their leaves bring a cooling effect to the garden. The two-tone effect of green infused with yellow or white adds punch to a composition. Such variegation is uncommon in our native flora, with the exception of a few cultivars from one of our most widespread ceanothus and a surprising assortment from two conifer species. All of the ceanothus are selections of Ceanothus thyrsiflorus, with ‘Borne Again’, ‘Diamond Heights’, ‘El Dorado’, and ‘Silver Surprise’ the most readily available. Port Orford cedar (Chamaecyparis lawsoniana) is a remarkable source of colorful foliage. Although highly prone to mutation when cultivated, this phenomenon rarely occurs within its limited natural range. Literally hundreds of clones have been selected and introduced since the late 1800s, offering gardeners a dizzying array of silvers, blues, yellows, and variegations of differing shapes and sizes. These unusual forms are popular in the British Isles and the Pacific Northwest but seldom show up in California gardens. Instead, one occasionally sees yellow green cultivars of Monterey cypress (Cupressus macrocarpa). The deep green, sculptural beauty of this iconic tree is simply stunning in its native habitat and as a highly prized specimen in coastal gardens. For its novelty alone, the lime green to golden yellow foliage of ‘Aurea’, ‘Citriodora’, and ‘Saligna Aurea’ is just the thing to spice up a container garden or provide contrast among more conventional shades of green. When your garden contains a solid framework of foliage plants, other desirable features will attend. Myriad forms and textures, showy fruits, and appealing bark are often part of the package—as well as comely flowers. And a host of deciduous species—bigleaf maple (Acer macrophyllum), California sycamore (Platanus racemosa), creek dogwood (Cornus sericea)—contribute twofold with vibrant green leaves in spring and summer, then golden yellows, parchment tans, and plum reds as winter approaches. So, as you eye all the beautiful flowering plants at spring plant sales, give some thought to appearances after the party’s over. Add a handful of natives with verdant, chlorophyll-laden leaves to carry your garden composition and its visual delights through every season. This article appeared in a slightly different form in Ironwood 16:2, published by the Santa Barbara Botanic Garden.